The traditional district (moku) of Kāʻanapali consisted of five major stream valleys (Honokōwai, Kahana, Honokahua, Honolua and Honokōhau), all of which were extensively terraced for wet taro (loʻi) in early historic and later times. Honokahua Valley has been described as having wet taro (loʻi) lands, although not in great abundance; sweet potatoes were reportedly grown between Honokōhau and Kahakuloa Ahupuaʻa, presumably on lower kula lands. The Kahana Ahupuaʻa was known as a place of salt gathering for the people of Lāhainā. There are six bays located on Maui’s west shore whose names begin with the word Hono. These bays and coves are collectively known as Hono a Piʻilani. From South to North, six of the identified bays are Honokōwai (bay drawing fresh water), Honokeana (cave bay), Honokahua (sites bay,) Honolua (two bays), Honokōhau (bay drawing dew) and Hononana (animated bay). After seventeen years of service, Dr Dwight Baldwin was granted 2,675-acres, the lands of the Mahinahina and Kahana ahupuaʻa, for farming and grazing. From that base, new lands were acquired until the holdings, known as Honolua Ranch, reached 24,500 acres in 1902. First starting as Honolua Ranch (1912,) then Baldwin Packers (1914,) this area was home to the largest producer of private label pineapple and pineapple juice in the nation. After mergers and other name changes, in 1969, Maui Land & Pineapple Company, Inc (ML&P) was created; then, the largest employer on the island of Maui. In 1974, ML&P carved out 1,650-acres of its nearly 22,000-acres to form a wholly-owned subsidiary, Kapalua Land Company. That year, the master-planned community that makes up the Kapalua Resort (with five white sand beaches) was approved by Maui County. In 1978, the Kapalua Bay Hotel opened, beginning the change of the former ranch and pineapple lands at Honokahua into a world-class destination resort complex. In 1987, during the excavation and construction of the Ritz Carlton hotel within the Kapalua Resort, hundreds of native Hawaiian burials were discovered on the planned hotel site. Associated with that, the state paid $6-million for a perpetual preservation easement and restoration of the burial site. A 14-acre site is now a historical and cultural landmark. In addition, as a result of this, Hawaiʻi’s burial treatment law, passed in 1990, gives unmarked burials, most of which are Native Hawaiian, the same protection as modern cemeteries. Kapalua serves as the home of two of Maui’s longest running signature events, the Kapalua Wine & Food Festival and the PGA Tour’s Hyundai Tournament of Champions. The intent of the Kapalua Resort was to provide a luxurious resort atmosphere removed from the Lāhainā-Kāʻanapali area. With that, it serves as an example of a low-key, low-density destination resort community. Recently a public coastal trail was incorporated into the Resort; eventually, the trail will be approximately 3.5-miles in length, running from Lower Honoapiʻilani Road through the Kapalua Resort to Honolua Bay. 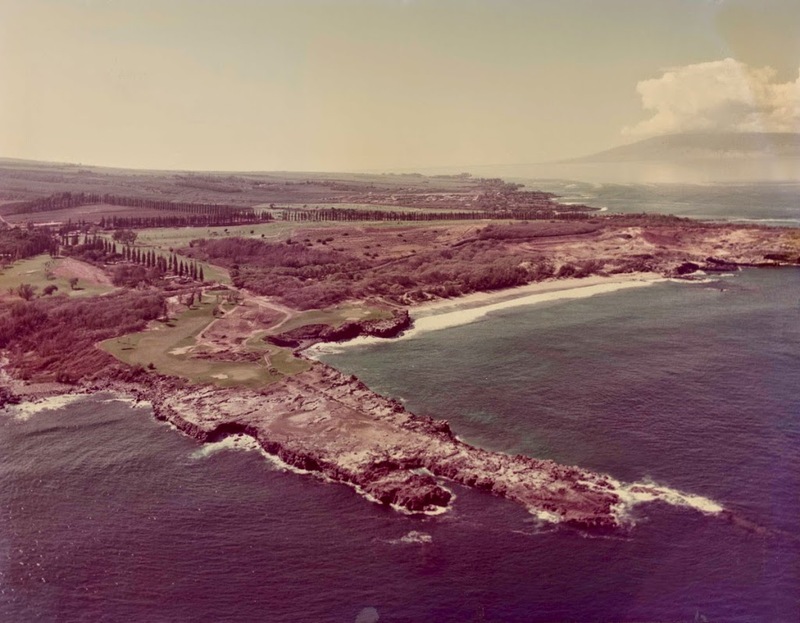 The image shows Kapalua in 1976. In addition, I have added related images in a folder of like name in the Photos section on my Facebook and Google+ pages. The traditional moku (district) of Kāʻanapali consisted of five major stream valleys Honokōwai, Kahana, Honokahua, Honolua and Honokōhau), all of which were extensively terraced for wet taro (loʻi) in early historic and later times. Honokahua Valley has been described as having wet taro (loʻi) lands, although not in great abundance. Sweet potatoes were reportedly grown between Honokōhau and Kahakuloa Ahupuaʻa, presumably on lower kula lands. South of Kapalua Resort, Kahana Ahupuaʻa, was known as a place of salt gathering for the people of Lāhainā. 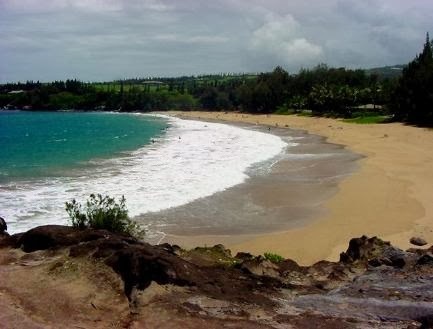 There are six bays located on Maui’s west shore whose names begin with the word Hono. These bays and coves are collectively known as Hono a Piʻilani. From South to North, six of the identified bays are Honokōwai (bay drawing fresh water), Honokeana (cave bay), Honokahua (sites bay,) Honolua (two bays), Honokōhau (bay drawing dew) and Hononana (animated bay). According to oral tradition, Piʻilani unified the entire island of Maui, bringing together under one rule the formerly-competing eastern (Hāna) and western (Wailuku) multi-district kingdoms of the Island. In the 1500s, Chief Piʻilani (“stairway to heaven”) unified West Maui and ruled in peace and prosperity. His territory included the six West Maui bays, a place he frequented. Battles were fought across West Maui, from Ukumehame to Honokōwai. Kamehamehanui engaged the forces of his uncle from Hawai‘i to fight with him, whose troops numbered over 8,000, and Kauhi brought troops of warriors from O‘ahu. Kapalua Resort is situated along this coast between Honokahua and Honokeana. Agricultural use of the property for pineapple cultivation began in approximately 1912 when Honolua Ranch (which included the property) was converted from a cattle ranch into a pineapple plantation. By the 1920s, pineapple had been planted across West Maui from Miihinahina ahupua’a to Kahakuloa ahupua’a A cannery was built in Honokahua in 1914 and, in 1923, Honolua Ranch became Baldwin Packers, Ltd. In 1962, Maui Land & Pineapple Company, Inc. was formed when Baldwin Packers merged with Maui Pineapple Company. Maui Land & Pineapple Company, Inc., created the wholly-owned subsidiary named Kapalua Land Company, Ltd., which conceived of and developed the master-planned Kapalua Resort featuring the Kapalua Bay Hotel at the shore of Honokahua ahupuaʻa. The hotel opened in 1978, beginning the change of the former ranch and pineapple lands of Honokahua into a world-class destination resort complex. Starting in 1987, to prepare for proposed ocean-side construction of the Ritz Carlton at Kapalua more than 900 ancestral native Hawaiian burials were excavated from sand dunes at Honokahua, Maui. When the extent of the burials became more widely known, native Hawaiians from around the state staged protests. Now, Kapalua at Honokahua includes The Ritz-Carlton, the Ritz-Carlton Club and Residences at Kapalua Bay, the Kapalua Spa, eight residential subdivisions, two championship golf courses (The Bay and The Plantation,) ten-court tennis facilities, several restaurants, and over 800 condominiums, single-family homes and residential lots. (In 2006, the Kapalua Bay Hotel was taken down.) Fleming Beach Park is at Honokahua Bay. The image shows Honokahua Bay. In addition, I have added other related images in a folder of like name in the Photos section on my Facebook and Google+ pages.